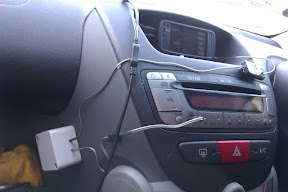 This is a follow on from my previous post in which I made a vague effort to stop my mp3 player/phone making noise when it was connected to my car radio while charging. While the linear regulator helped reduce the noise, it was still audible. 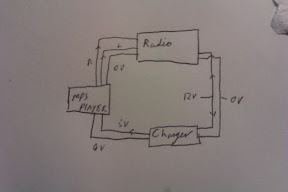 Time for a ground loop isolator! 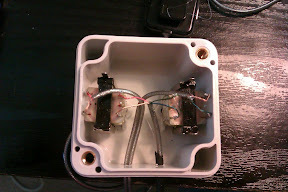 For the uninitiated, a ground loop is where the ground/shielding/0v connections form a loop (hence the name). 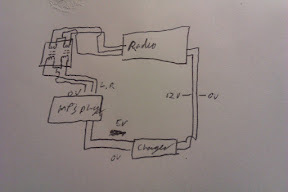 In theory this wouldn't be a problem, except that devices within a ground loop usually want to be at different potentials and throw tantrums if they can't have it their way. Or something like that... See wikipedia for a real explanation. 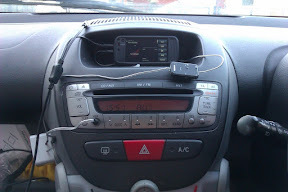 In my case the phone, radio and charger form a loop and I end up with lots of whiney noise coming from the speakers. To the workshop shed basement desk that I use for everything! Tea is the most important part of engineering, closely followed by hotglue and shiny things. This should really be the first step, but it's a really basic project.